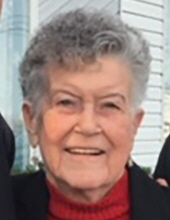 Violet Donophan Glanden passed away peacefully Sunday March 31, 2019 surrounded by family at Kent General Hospital in Dover, DE. She was 86. Violet was born March 10, 1933 to the late William and Georgia Donophan in Kent County, DE. Her career included time as the Executive Secretary to three presidents of ILC Industries. There she met many Apollo era astronauts when they came to Dover for their space suit fittings and travelled to Houston, TX and Cape Canaveral, FL to observe space mission launches. Later she worked for Schmittinger & Rodriguez law firm and finished her working career at the age of eighty as Chief Deputy Register of Wills of Kent County, DE. Mrs. Glanden is survived by her two sons, Herbert and his wife Kimberly, Donald and his wife Susan. Grandchildren Julie Rotuno and her husband Matthew, Hayes Glanden and his wife Michele, Jessica Glanden and Elizabeth Glanden. She is also survived by four great-grandchildren, two brothers (James Donophan and Charles Donophan, two sisters, Angilee Hobbs, and Joan Donophan and many nieces, nephews, and cousins. A memorial service will be held at Torbert Funeral Chapel South, 1145 E. Lebanon Road (Rt.10), Dover DE on Sunday April 7. Visitation is from 1:00 PM to 2:00 PM with a memorial service beginning at 2:00 PM. Grave site services will be at Lakeside Cemetery immediately following the memorial service. In lieu of flowers, the family suggests donations to a local charity of your choosing. Letters of condolences may be sent and guest book signed at www.torbertfuneral.com. To send flowers or a remembrance gift to the family of Violet D Glanden, please visit our Tribute Store. "Email Address" would like to share the life celebration of Violet D Glanden. Click on the "link" to go to share a favorite memory or leave a condolence message for the family.